EARLY STAGE ORAL CANCER IS OFTEN PAINLESS AND GOES UNDETECTED. EVERY DENTAL CHECKUP SHOULD INCLUDE A SIX-STEP SCREENING. Get informed. Know the early signs of oral cancer. Get a thorough Six-Step Oral Cancer Screening. Catch it early. Establish a system so every patient has a Six-Step Screening by a dentist or dental hygienist. Scroll through the six steps to a thorough oral cancer screening by either clicking on one of the boxes or sliding your finger across the image. Pull out the tongue with gauze, visually examine it for any swelling, ulceration or variation in size, color or texture. Gently run your index finger along the lateral borders to feel for any hard tissue. Roll the tissue of the buccal mucosa and lips between your fingers. Note any firm or nodular areas, texture or color changes.Pull the upper and lower lips out completely, examining the labial mucosa and sulcus of the maxillary vestibule and frenum, and the mandibular vestibule. 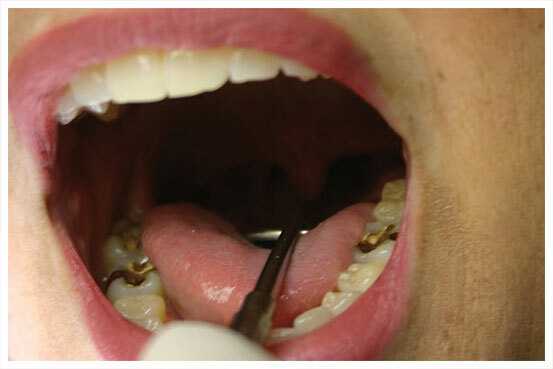 Visually examine the floor of the mouth and palpate it bimanually with a gloved finger beneath the tongue and another under the chin on the exterior skin. Check the hard and soft palate visually and palpate with your finger. Roll tissue over the edge of the mandible.Have your patient look down and turn his head to the side which makes the Sternocleidomastoid muscle (SCM) stand out. Roll the soft tissue of the neck over the SCM. Palpate the tissue around the Adams apple. Take a good look at the tonsils and the back of the throat. Check for asymmetry, ulceration or redness.Examine the retromolar pads and all of the adjacent tissue. Ask your patient if they have experienced any hoarseness, voice changes, or pain. Dental professionals endorse the Six-Step Screening as a useful tool.